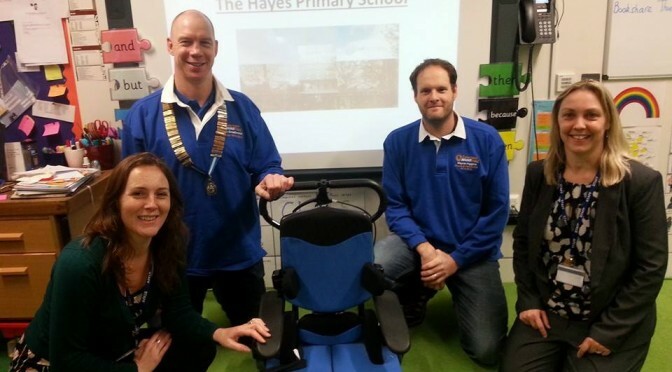 Caterham Round Table has recently funded an electric assistance chair for Hayes Primary School. This helps children suffering from physical issues to remain included in mainstream schooling. Even at a cost approaching £3000, this is money well spent when it helps to improve the well-being of youngsters! The members of Caterham Round Table also raised about £6500 for St Catherine’s hospice two weeks ago at the Winter ball (which was a great night out! ), and we’ve also just donated £1000 to the Dene Hospital as well! All of this money has been raised through events such as the Fireworks, Beer Festival and Winter Ball, all of which are hard work, but great fun to be involved in.